As you could probably gather from my list of resources for arthritis patients and their families, there are a lot of things on the Internet that can help spoonies. But there are several ways that the Internet helps us without mentioning specific sites or specific illnesses/conditions. 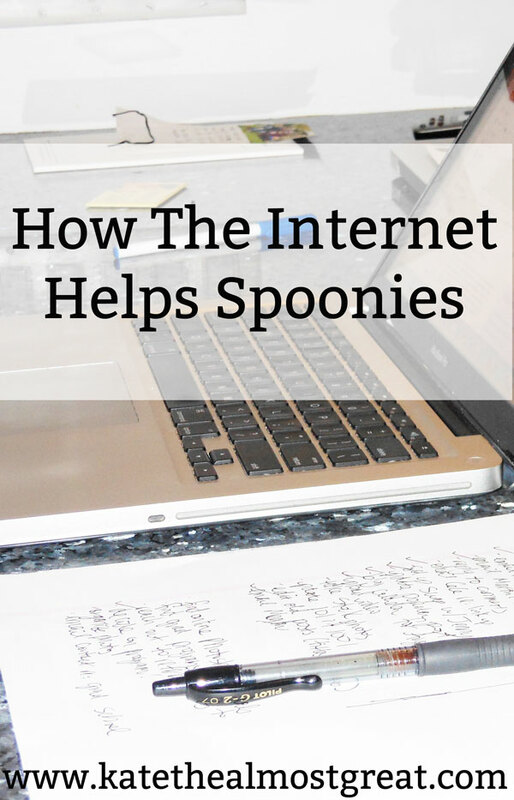 Here are 7 ways that the Internet helps spoonies. It connects people who might not be able to meet otherwise. There are so many people across the country and world dealing with what you’re dealing with, but there aren’t always as many right in your town or your circle. We can research our conditions. Obviously, this isn’t always a great thing, but it can help us understand our conditions better. Doctors don’t always explain things in a way that we understand, and sometimes, we’re so shocked by the diagnosis that we struggle to remember everything they say. You can hear about other people’s reactions to medications or symptoms. For example, getting feedback from people on whether their side effects were worse on methotrexate pills or injections. Usually, there’s someone out there who has a suggestion on what to watch on Netflix while dealing with painsomnia or how to spend your time depending on where you’re having pain. For those who are unable to leave their house much, they can still interact with other people. This is the biggest thing for me, personally. Back in February, I had knee surgery followed by my infusion a few weeks later. Because Boston was completely covered in snow – you may have heard about how we received over 109 inches of snow – and I was recovering from surgery, I hardly left the house. But it didn’t feel that way because I spent so much time on social media. Spoonies can meet people who understand what their lives are like. Many don’t know anyone in person who understands what living with chronic illness is like, but they can meet those who do through social media. As a whole, spoonies can feel less alone. How? By the previous 5 reasons. Overall, I am so grateful that the Internet exists. Without it, I don’t want to think about what my life would be. Spoonies, how has the Internet helped you?